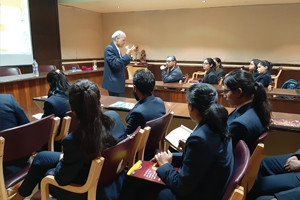 The Training & Placement Department, RIET, Jaipur organized an expert talk by Shri Khemraj Chaudhary, on 6.2.2019. The main speaker on this occasion is an IAS and Additional Secretary, Animal Husbandry, Fisheries and Gopaalan Department, Commissioner Fisheries Department Rajasthan. Shri Khemraj Chaudhary has been holding important posts in the past. He has worked as Director with the Rajasthan Housing Board, Jaipur, Rajasthan state mines and minerals, Rajasthan state Road Development, Rajasthan Renewable Energy Corporation, Rajasthan Tourism Development, Rajasthan state beverages Ltd are among many other. 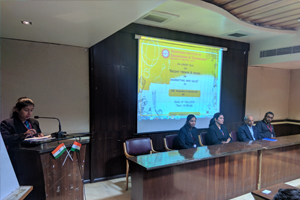 Dr Saroj Hiranwal, Principal RIET, Dr Monika Shekhawat, HOD MBA & T&P Officer and Prof D D Johri, Advisor T&P welcomed the guests on this occasion. This session was attended by all HODs, faculty members, MBA & B.Tech students of of RIET, Jaipur. Shri Khemraj Chaudhary, spoke at length about the recent trends and issues in marketing and sales. He said today’s customers place a greater weight to direct motivations (convenience, status, style, features, services and qualities) to buy product. Today’s marketers give more emphasis on the notion, “offer more for less.” There are many factors within the growth of the performance marketing. Technology certainly had a big role to play. 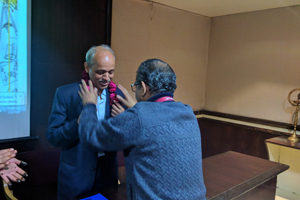 Dr Saroj Hiranwal, Principal RIET, said that in dynamic nature of present scenario of industry working culture, use of technology and skill requirements are changing at a rapid pace. The recent trends and issues in marketing and sales have changed to a great extent and the budding engineers and management professionals must be aware of them. She also said that the workshops of this kind help students to be aware of various changes and developments in various industries. This is helpful for faculty members also as they come to know about latest trends. The vote of thanks was extended by Dr Monika Shekhawat, HOD MBA & T&P Officer. Speaking on the occasion she mentioned that this talk imparted an insight to the students as well as faculty members about the upgraded use of technology and skill in regard with the recent trends and issues in marketing and sales. She thanked Shri Khemraj Chaudhary for giving his valuable time and imparting this knowledge.